Nathan MacKinnon, C (NHL.com rank: 12) -- To say the 22-year-old had a breakout season doesn't do justice to his NHL career-high 97 points (39 goals, 58 assists) in 74 games in 2017-18. He had nine multigoal games (tied for first in NHL) and one game without a shot on goal. His week-to-week dominance led to a third-place finish in Yahoo behind forwards Evgeni Malkin of the Pittsburgh Penguins and Nikita Kucherov of the Tampa Bay Lightning. MacKinnon finished fifth in the NHL in points and second in points per game (1.31; min 30 games) behind Connor McDavid of the Edmonton Oilers (1.32). MacKinnon will have a much higher average draft position this year but should finish among the top five centers for the second straight season. 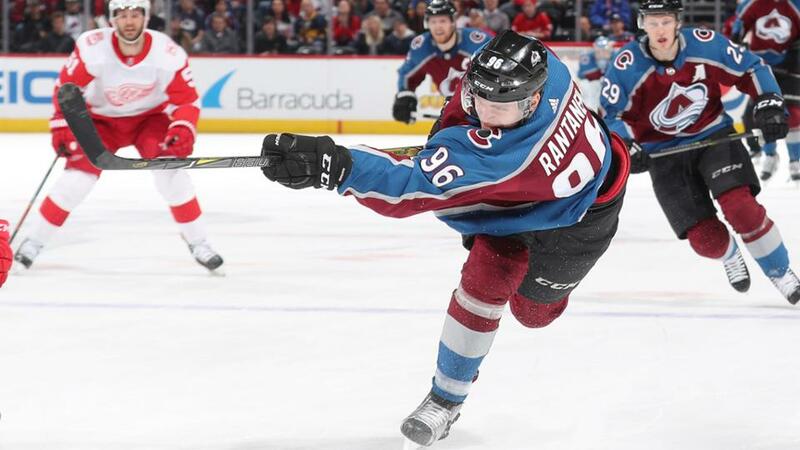 Mikko Rantanen, LW/RW** (67) -- The 21-year-old made his presence felt on the fantasy landscape with 84 points (29 goals, 55 assists) in 81 games. He formed one of the best fantasy duos with MacKinnon on the first line, where they combined for 51 team goals (second in NHL). Rantanen finished eighth in the NHL with an Avalanche-high 35 power-play points but could generate more shots on goal this season than the 178 he had in 2017-18. It's likely Rantanen will be available outside the top 50 in season-long drafts with a realistic chance to finish among the best 30 players on Yahoo. Tyson Barrie, D (88) -- The 27-year-old missed 25 games with a hand injury but made an immediate impact upon returning with 30 points (10 goals, 20 assists), including 13 PPP in the final 34 games. Barrie finished tied for first in PPG among NHL defensemen with Brent Burns of the San Jose Sharks, Shayne Gostisbehere of the Philadelphia Flyers and Seth Jones of the Columbus Blue Jackets (seven), and his 30 PPP were third behind Gostisbehere (33) and John Carlson of the Washington Capitals (32). Even with injury concerns, Barrie should be one of the top 15 defensemen selected in fantasy drafts. Gabriel Landeskog, LW (107) -- The No. 2 pick in the 2011 NHL Draft tied NHL career highs in PPP (17) and PPG (eight) last season. Landeskog, 25, solidified his even-strength role on the top line and on the first power-play unit with MacKinnon and Rantanen. He played an NHL career-high 3:45 per game on the power play and had an Avalanche-high seven points (four goals, three assists) in six Stanley Cup Playoff games. Landeskog likely will be taken outside the top 100 in drafts but with exposure to MacKinnon and Rantanen, he should finish much higher than his ADP and has added value in hits leagues (149; first among Colorado forwards). Semyon Varlamov, G* (130) -- The 30-year-old had a bounce-back season numbers wise in 2017-18 (.920 save percentage; 2.68 goals-against average), but he missed 18 regular-season games because of injury and illness, and he was out all six playoff games with a knee injury. He has value if he falls in season-long drafts but is not worth reaching for after two straight injury-plagued seasons. The Avalanche brought in Philipp Grubauer as Varlamov's backup, but Grubauer could emerge as the starter, as he did with the Capitals at the end of the regular season and in the first two games of the Stanley Cup Playoffs. Philipp Grubauer, G (131) -- The 26-year-old ranks third in the NHL in even-strength save percentage (.935; minimum 50 games) over the past two seasons behind Sergei Bobrovsky of the Columbus Blue Jackets and Antti Raanta of the Arizona Coyotes (each .936). It's too early to say whether Grubauer projects to be a No. 1 goaltender, but his fantasy stock has risen now that he will split starts with the injury-prone Varlamov. Erik Johnson, D - INJ. (181) -- The No. 1 pick in the 2006 NHL Draft played an NHL career-high 25:26 per game last season but missed 20 games with multiple injuries. When healthy, Johnson was fantasy relevant with 25 points (nine goals, 16 assists) and 168 SOG in 62 games. The 30-year-old has added value in hits leagues (168) and is worthy of a late-round flier despite the injury concerns.